Richmond, CA—This morning the California Apartment Association moved to file a Temporary Restraining Order (TRO) against Measure L, the rent control and just cause for eviction ordinance that was passed by 64% of Richmond voters this November, and went into effect on December 30th, 2016. The City Attorney’s Office in Richmond mounted an effective defense against the TRO, and it was rejected at 10:30am this morning by Judge Raddick at the Martinez courthouse. 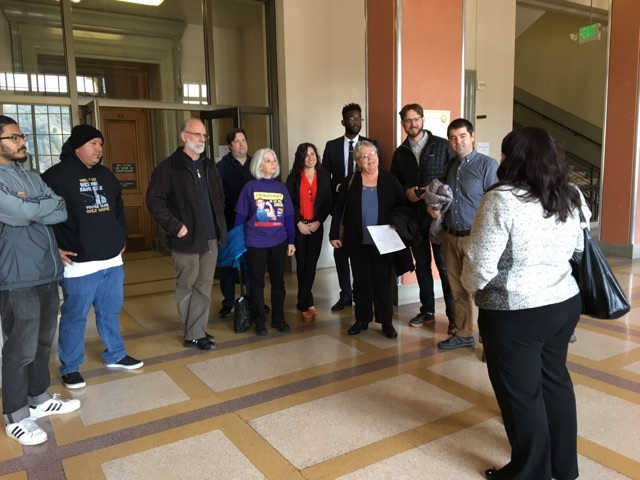 The Fair and Affordable Richmond Coalition, including SEIU Local 1021, the Richmond Progressive Alliance, Alliance of California Communities for Empowerment Action, and Tenants Together attended the court hearing to defend rent control. "The California Apartment Association wants landlords to continue gouging tenants with unlimited rent increases, but the voters have spoken. It is our right to regulate rents and evictions in California. It's time for the landlord lobbyists to accept the voice of the people," said Aimee Inglis of Tenants Together.